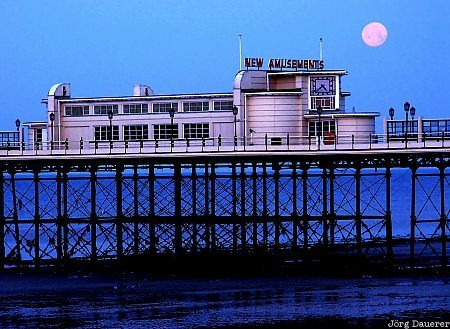 Moonset over Worthing Pier in Sussex in the south-east of England, United Kingdom just before sunrise. I took this image in the very early morning of a sunny day in June of 2003. I have to admit that I was surprised to see the full moon setting over the North Sea when I reached Worthing Pier at 4:30 in the morning. Obviously I had not done my homework (but I was lucky). This photo was the image of the month in January of 2010. This photo was taken with a digital camera.